American Orientalist and librarian; son of Marcus Jastrow; born Aug. 13, 1861, at Warsaw, Poland. His family removed to the United States in 1866, and settled in Philadelphia. Morris received his early education chiefly at private schools until, in 1877, he entered the University of Pennsylvania. He graduated from that university in 1881, and shortly afterward went to Europe with the intention of studying for the Jewish ministry. He entered the seminary at Breslau and at the same time took up the study of Oriental languages at the university there. In 1884 he received the degree of Ph.D. at Leipsic, and spent another year in Europe, continuing his studies in Paris and Strasburg. On his return to America he occupied the post of lecturer to his father's congregation for a year, but at the expiration of that period determined to leave the ministry. He was elected to the chair of Semitic languages in the University of Pennsylvania in 1892, a position he still (1904) holds; in 1898 he accepted the post of librarian of that university. 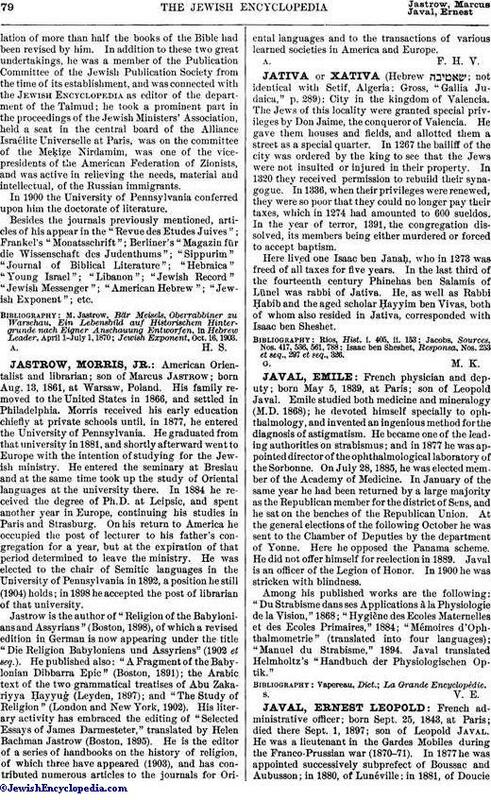 Jastrow is the author of "Religion of the Babylonians and Assyrians" (Boston, 1898), of which a revised edition in German is now appearing under the title "Die Religion Babyloniens und Assyriens" (1902 et seq.). He published also: "A Fragment of the Babylonian Dibbarra Epic" (Boston, 1891); the Arabic text of the two grammatical treatises of Abu Zakariyya Ḥayyuġ (Leyden, 1897); and "The Study of Religion" (London and New York, 1902). His literary activity has embraced the editing of "Selected Essays of James Darmesteter," translated by Helen Bachman Jastrow (Boston, 1895). He is the editor of a series of handbooks on the history of religion, of which three have appeared (1903), and has contributed numerous articles to the journals for Oriental languages and to the transactions of various learned societies in America and Europe.